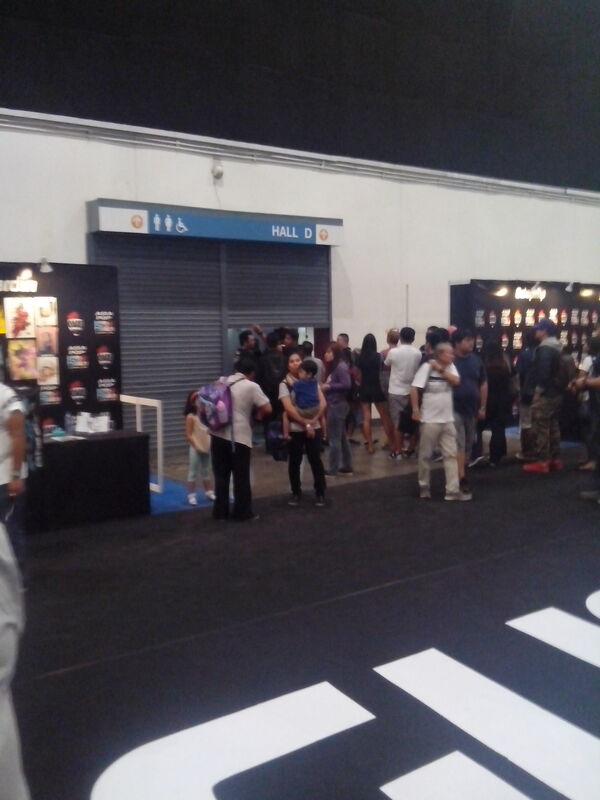 Without a doubt, Asia Pop Comic Con is an event of firsts here in Manila! Structure-wise, it really went to show its promise as a comic convention. The floor plan was great! There was a massive crowd going inside but one could still walk through without the hassle of con-goer traffic jam. The venue is also perfect, it maintained the area cool and relaxing, perfect for someone to either walk or just sit around, considering that outside was absurdly HOT! Then again, perfect as it may sound, this convention still has its cons and these will probably be the focus of improvement. The Captain America: Civil War sneak peek screening schedule and guidelines weren’t discussed properly. A lot of folks waited last Saturday for the screening, waiting at Hall D as early as 12:30 PM. When all the panel discussions were finished, finally it’s screening time! Guess what folks, wrong! All of the people outside were asked to exit Hall D to line up again, causing a lot of complaints from people who were sitting there since coming to the event. When everyone was left with no choice, they exited the hall properly, only to find out that there is already an anaconda of a line outside for the screening, shattering their hopes and chances to view the sneak peek. An addition to the screening dilemma, those who viewed the sneak peek had to surrender their phones and cameras to the officials to prevent illegal cam-cording. That’s already an event protocol, so at first it was ok. Wrong again, folks. The management didn’t have a system of collecting the phones, they just collected it, and the person was free to claim it afterwards. They also had a disclaimer, “APCC will not be held liable for loss/damages to these surrendered mobile phones/gadgets“. This means either your phone could get stolen by someone claiming it was theirs, or it could get damaged with APCC being excluded from liabilities. The system surely can be improved on, with claim stubs, proper collection of the phones, and an actual closet for gadgets such as those just to guarantee the guests that at least, THEY ARE SAFE. Sadly for this one, it wasn’t implemented. The Me Bit Vampy dilemma. Of course, everyone will line up for Vampy Bit Me. After all, she’s an international star at the cosplay scene. Here, one can get her artwork for a reasonable price, so every fan will be willing to dish out just to have them and get them signed. The only problem was, for Day 2, Vampy was ALL ALONE in her booth. Meaning: no Personal Assistants’s, no attendants, not even a person who would collect the money and give change to the people purchasing her artwork. She had to deal with those all by herself, while as a witness told us that day, the other guests had their own PA’s from the APCC staff. Ouch! To add another heavy burden, since Vampy’s line was really getting long, I believe she was supposed to take her lunch break at around 12:30 PM but she stayed on site just for the fans. Monika Lee and the other guests were already back from lunch and she was still there attending to the fans! Yes, it’s her intuition as a cosplay idol to cater her fans, but someone from the management could’ve prevented her from being overworked. After all, she is their guest. They have to take care of her. Also, considering she still had a meet-and-greet spotlight by 5:00 after her THE CAGE cosplay competition judging, she was supposed to be given a short rest at the very least. In the end, it’s still a great event. There is still room for improvement, and I strongly believe that the management can attend to these needs to hold a better, stronger event in the future! Once again, kudos to the APCC for a great event, and we’ll all be looking forward to the necessary improvements for next year! Cheers!